When we get that knock-back, it’s so easy to go into panic and tailspin mode. We start to question everything about ourselves and our lives, not just the problem at hand. We judge every single component of ourselves, examining each element under our critical lense. This is the time when a clear set of instructions is actually really helpful. When you’ve invested so much time and energy into something that doesn’t work out the way you want, it’s so tempting to just keep battling away. You feel if only you had worked harder you could have made it work. Or maybe that you failed and don’t deserve to take a break. You punish yourself. But this is exactly the time to stop for a short while and re-group. Trying to push on through when you’re exhausted, physically or emotionally or both, is just plain counter-productive. You won’t make good decisions when you’re emotional and panicky. It’s also a danger time for your physical health: our appetite is all out of kilter because we’re stressed, our sleep is restless or even elusive, our energy is drained and it’s tempting to rely on caffeine and junk to get us through, comfort or even punish ourselves. If you can take 24 hours out of your situation, as your (official or unofficial) health coach, I am writing you a permission slip. It’s vital to nourish your body at this time. Giving yourself fresh, living foods will support your nervous system, reduce the effects of stress and restore your energy. 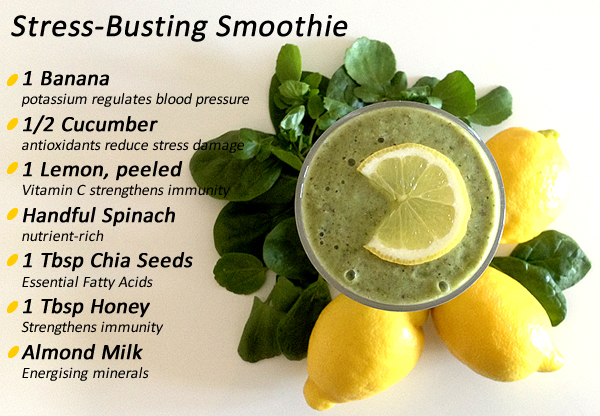 Try this recipe to support your body. It takes a few minutes to put together, so it’s ideal to keep you going when you really can’t be bothered to cook. During your time-out, be sure to focus on self-care routines. Be sure to do things that make you feel good, nourish you – there are suggestions in the Workbook. And try your absolute best not to feel guilty about it – feeling relaxed and refreshed is for your ultimate good and is the best circumstance to deal with your problem. 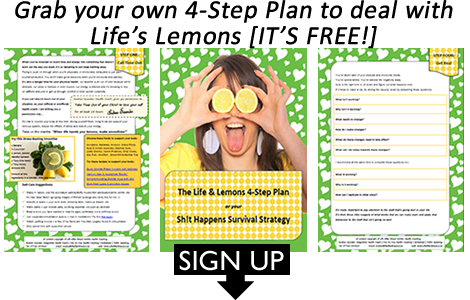 There are more self-care suggestions in the Life and Lemons Workbook I have created to accompany this post. You can receive your Free Copy HERE. Once you’ve given yourself some essential replenishment, if you feel like you need to vent, do it now. But set yourself a time limit. Set a timer for 10 minutes… now, GO! Really feel all those negative thoughts. Wallow. Get angry. Drop F-Bombs. Cry. Whatever comes up be sure to really feel it. But feel it without judgement. It simply is what it is. Write it all down if it helps. Say it all out loud to yourself or to a friend if you prefer. But don’t try to fix it. It isn’t time for that just yet. Have awareness of where you feel these thoughts in your body: is it your chest? or your tummy? your head? STEP 3: Shake It Out! Think of your body like a memory foam mattress: you stay in the same position and your body will hold those negative feelings in that same place. When you move your body, the shape releases, the memories shift, and you will find the negativity releases quicker. Although walks in nature and other soulful activities have their place, if you’ve just spent 10 minutes really feeling your negged out emotions, now is the time for something a bit less subtle! Short bursts of high activity are a great way to release those tensions from your body. I’m a big fan of dance breaks for this – just crank up a tune and get moving! Feeeeeel that negativity getting shaken out of your muscles! Shake It Out by Florence & The Machine. Feel free to sing, wail, shout, throw offspring-embarrassing shapes, chuck everything at it! You’ve taken care of your physical and emotional needs. You’ve danced the negativity away. Now is the right time to sit down and figure out what happens next. Use the questions in the Workbook to really drill down the issue and craft positive action. It’s also really important to acknowledge what is going RIGHT in your life! 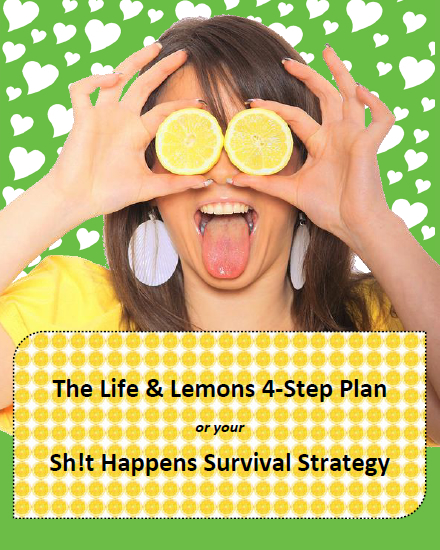 And the workbook will help you to focus on that too and use that information to help solve your current lemon-flavoured dilemma. So tell me, what was the last lemon-flavoured situation life threw at you? Did you take steps to preserve your health and sanity? Or did you soldier on through? I would love to read your story in the comments below.